For the exact dates of each semester, please click →here. For international visiting scholars and doctoral students at Heidelberg University, we have a different course programme. For more information, please click →here. Minimum number of students per class is 10. Students in the Socrates and Eramus programmes are eligible for a reduction in fees. For the exact date of the placement test, please click →here. from 4:30 p.m.  6:00 p.m. or 6:15 p.m.  7:45 p.m.
from 4:30 p.m. 7:45 p.m. Lessons are held in the Max-Weber-Haus, Ziegelhäuser Landstr. 17. For students with basic knowledge of German. For students with solid knowledge of German. 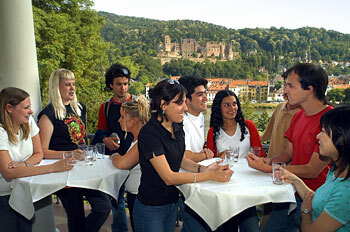 For students with an advanced knowledge of German who aim to improve their competence in academic language. At the end of the course, students in the Advanced stream have the opportunity to take part in the Obligatory Proficiency Examination (DSH). The semester programme for each language course is set according to the needs of the students. The course material will be announced at the beginning of the course.